What measures have been taken in the design to avoid contamination and what features are included to remove (sterilize versus decon) contamination? How does the CO2 sensor contribute to optimal cell growth? How does the humidity contribute to optimal cell growth? Ask for the uniformity and accuracy data versus asking for a water jacket or air jacket. Do you need O2 control to simulate the environment for your experiment accurately? Calculate the total cost of ownership on the product over one year including product price, install, regular cleaning labor, material like HEPA filter, etc. Click here to read more about replacing your CO2 Incubator. ANOVA water bath systems are designed for sample warming, digestion, material prep, and a wide range of laboratory applications from ambient+10°C to 99°C. Front-mounted controls simplify operation & over-temperature safety circuitry prevents thermal runaway. Read more about the ANOVA Water Bath Systems by visiting the ANOVA webpage. Chemyx Classic syringe pumps are low cost and easy-to-use high precision dosing pumps designed for operation in laboratory environments. All our syringe pumps contain LCDs which display a "windows" like menu for easy operation and information display. 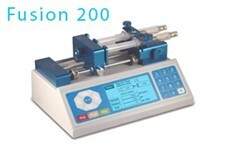 Fusion Classic Syringe Pumps Scalable syringe pumps for delivering exceptional quality and long-term value. Visit the Chemyx website to learn more about their Lab Pump offerings. How do you put water in water jacket. It is showing low water indicator. Help this member. We have several units, which are not able to reach 37C. Is that something general? Also when you open the door the unit needs a long time to get back close to 37C. Advise this member. I have a 240i Heracell. The AutoStar function is blocked, it does not allow ContraCon. Humidity sensors and door work but also is blocked, does not allow decontamination process. How can I solve this? Porvair Sciences has announced a new 5-layer cell culture flask developed to fulfil the need of the growing number of applications that require large numbers of cells. The new 5-layer cell culture flasks provide easy pipette access for direct addition of reagents and cells as well as efficient recovery of valuable cells and reagents thereby reducing the risk of contamination due to pouring. Read more. Hamilton Storage Technologies introduced Hamilton BiOS® M and L, two Image removed by sender. BiOS Mcompact, high-density automated systems designed to fit into existing laboratories that require ultra-low-temperature storage of sensitive biological samples. These flexible, energy-efficient and scalable systems ensure the viability of 100,000 to over one million long-term samples. Read more. A versatile balance for biotech, cosmetics, and pharmaceutical applications requiring counting, summing, holding, and fully traceable results is being introduced by Alliance Scale, Inc. Ideal for blending ingredients, it has a bright, backlit 2-line alphanumeric LCD and accommodates multiple weighing units including a user defined custom unit for proprietary applications. Read more. It's been acting funny for a few months, raising the CO2 to 22%, the temp just shutting off unexpectedly, then i came in and it was showing nothing on the display but "calibration." It wouldn't budge so I shut it off and then after 10 count turned back on. Everything lights up and the alarm screams- no button reacts so I'm forced to turn it off. Have tried repeatedly but this is all it does. It's not an old model so I'd like to fix it. Do you think its brains are scrambled and I need a new computer board? I will try to contact the company meantime but hoped someone out there could point me to an easy solution. I have a problem with setting +39C in my incubator. I need to increase temperature to +39C, but every time when the temperature in the incubator is over 37.5C the alarm is on. Is there any possibility to change the upper limit alarm to 40C? I could not find the information in the user's manual. Share your knowledge. I have a CB 150, serial number 01-28848. It was recently serviced - we replaced a CO2 sensor - but now the n2 value exceeds the set value (it just shoots up). The valve was replaced as well but the value still exceeds set value. I am now suspecting the sensor but think its going to be expensive replacing it (already spent a fortune replacing the CO2 one). Is there a way of cleaning the sensor? or fixing it? Respond to this member.